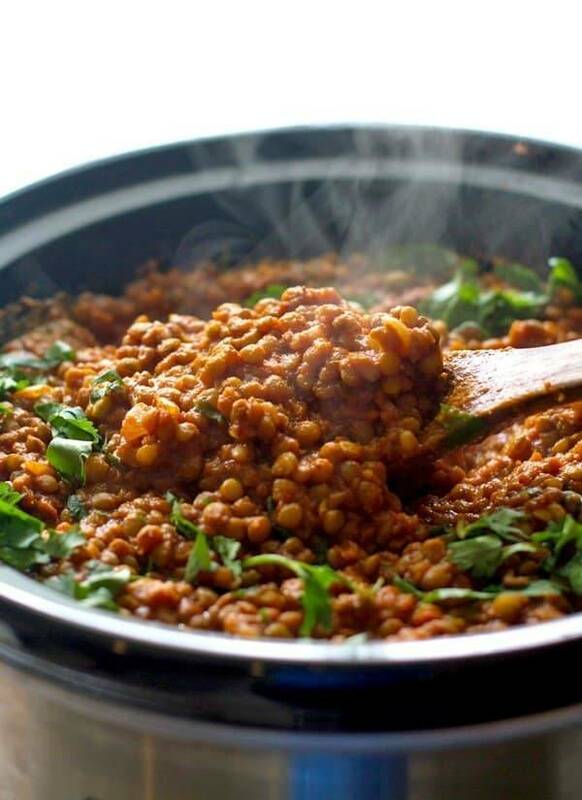 Red lentil curry is one of my favorites! This version is so simple – just toss everything in the crockpot. Easy, healthy, and full of flavor. Check once or twice during cooking to add more water or tomato puree if the lentils are soaking up all the liquid. The amount of water or tomato puree you add depends on how soupy your want your lentils to be. For me, 1 1/2 cans of tomato puree plus the two cans of water was perfect. Taste and season with salt. Lentils will be soft when they are done cooking. 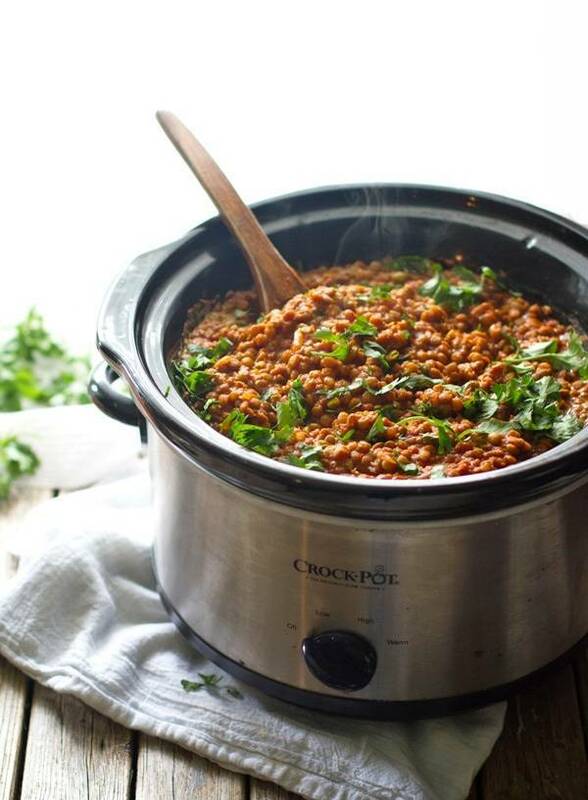 I’m obsessed with lentils–I love all your lentil recipes and can’t wait to try this crockpot version!! I love lentils. 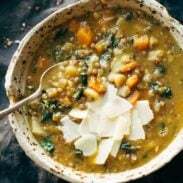 I usually make Tuscan lentil soup, but love a curry alternative. Gorgeous pics. May try this in my cast iron pot in the oven instead. I’m not the biggest lentil love (yet!) but I’d still love to give this a try! Come on girl! Jump on the lentil train! This looks like a winning flavour combo! Yum! We make “masoor” all the time at home in India, though our version is quite different. I’m definitely going to try this one too, looks yum! 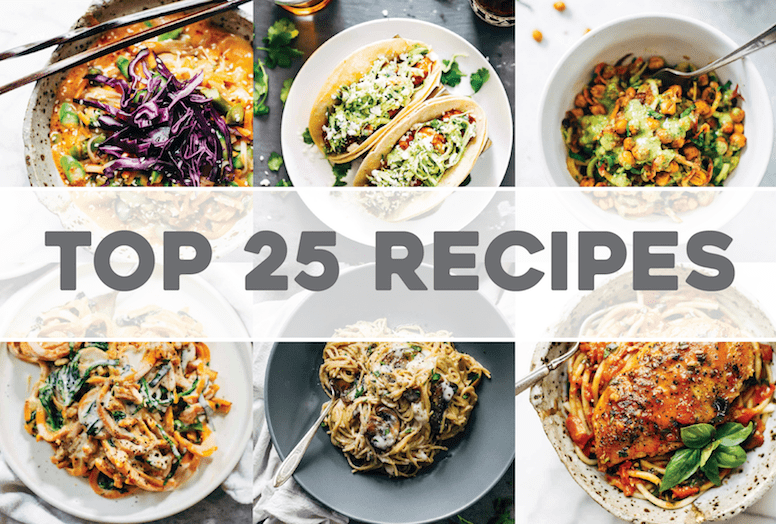 Hi – new to your site and I’m loving all the great recipes! Quick question: red curry paste…thai style or Indian (if there is such a thing)? usually mine is Thai style. I often buy the Thai Kitchen brand. This looks great! I do have a question though. I would love to try cooking this sometime, but I’d be cooking for only two people, so how would adjust the recipe for two people? Really want to try this but with 5 tbsp of curry paste, how spicey would you say it is? I’d like to serve it for dinner but wonder if its too spicey for the little ones!? I made these tonight and they were really good and not that spicy at all. It does make a huge batch so I’m wondering if you’ve ever froze small portions to enjoy later? I have some in the freezer right now! 🙂 I’d suggest freezing them in smaller batches so you can heat up individual or 2-person servings later on. 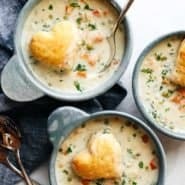 Forgive my ignorance, but I am, at this very moment, preparing to make this recipe, and I am wondering, the recipe says to add the coconut milk just before serving, and since I intend to freeze at least half, should I wait to add it, or go for it as soon as its done and then freeze? Yep! it does freeze well. I actually have some in my freezer now. Nothing special about reheating it, other than that it might need a little water to come back to the original consistency. What exactly is meant by “tomato puree”? It’s not a phrase I see in the supermarkets around here, and Googling it seems to return interpretations of both pureed tomatoes (which would have been my guess, oddly enough) but also what seems to amount to, basically, tomato sauce. Thanks! This looks and sounds great! Just a suggestion, try it “legit Indian style ” by cooking it in a pressure cooker. Soak the lentils overnight and those little guys will take minutes to cook. A pressure cooker will change your life. Thanks for the tip Bryan! Just made this and it is AMAZING! I used fresh ground masala and a whole can of coconut cream and had it over Black Sweet Thai rice. Definitely a keeper! Thanks Nadene! Glad you liked it! any suggestions for making this recipe without red curry paste or should I wait? and get the right ingredients? This looks really yummy, going to try it soon. I loved your regular curried lentils. I sort of used your recipe to make a lentil dish in my crock for tonight. I was missing a few ingredients, such as curry paste and fresh ginger, so I used the spices I’d normally put in a lentil dal, such as curry powder and cumin in addition to turmeric and garam masala. I also had fresh tomatoes that needed to be used, so I pureed them in my Vitamix rather than opening a can and just guessed on the water. I also tossed in a couple of small sweet potatoes that I had around (diced) and omitted the sugar and oil. I used a whole can of coconut milk, as another commenter did, and it came out really good! We had it over quinoa with cauliflower on the side and I mixed it in mine. The kids ate a little and my husband loved it, so we will find a way to use the leftovers either this week or frozen. Thanks for the inspiration! Is it possible to make this using red lentils instead of brown ones? Not sure how they differ, other than the color, but want to be sure… Thanks! Ok, me again 🙂 I went to Whole Foods for brown lentils. I only saw green, red, and French. The French looked brown-ish to me so I bought them, only to learn just now from google that they are not technically considered the brown kind. So. My question is, can I make this with the French lentils and/or what accommodations would need to be made, if any? I could not find the Masoor kind, except in an already pre-made mix looking bag (i.e., with other spices, dried tomatoes, etc. – I think that’s what they were. I also saw them at Costco yesterday…)…. thank you!!!! this was ridiculously amazing. i think it’s the finest thing i’ve ever eaten. wow!! I’m making this dish for work on Halloween but I could only see red thai curry paste in the supermarket. Is it supposed to be a Thai recipe? I panicked and bought Dhansak paste?! It’s curry and it’s red. 🙂 Can I get away with this or shall I go back and get the thai paste? Hi Lindsay, I have this recipe in the crockpot as we speak and the apartment smells divine! My husband is going to want to eat it as soon as he walks through the door. I just wanted to say that the recipe ingredients list does not include water, but in your notes below the recipe you say you add water. Maybe this was an oversight? Anyway, I halved the recipe and used 1 can of puree and about 3/4 can of water. I will add more if it needs it throughout cooking. Just thought I might bring this to your attention. Can’t wait for dinner! Hi Danielle! I just meant to refill the cans with water (I think it’s listed in step 2). Thanks for the comment! Of course you did! 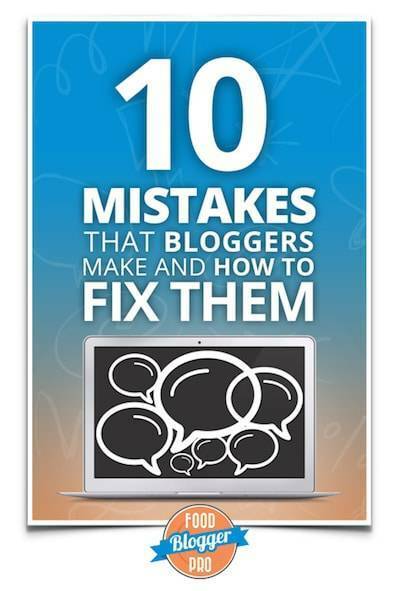 I have a habit of skimming when I read…sorry! This dish is delicious! Will definitely be making this a staple fall/winter dish! Would you say that if you don’t have a crowd to feed, you could cut the recipe in half and have enough for a normal size family recipe? 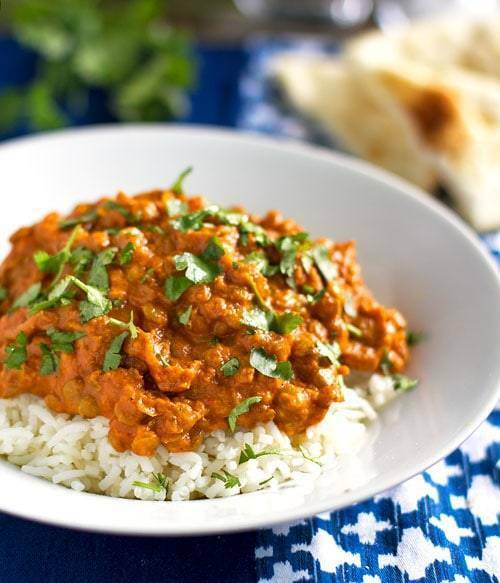 I stumbled on this website and recipe when looking for easy Indian lentil recipes for my new crockpot. We don’t have a dishwasher right now, so I try to keep my dinners to one pot, two max, and this fit the bill. I added chicken tenderloins because my husband doesn’t think it’s dinner unless there’s meat involved and spinach to sneak in some vegetables, and it was amazing, even better the next day. Thank you!